In 1995, after 5 years of study, Anja graduated with a Diploma in Biology (equivalent to M.Sc.) from the Ernst-Moritz-Arndt-University in her native Germany, after specialising in botany, landscape ecology and nature conservation. In 2004, she acquired a Postgraduate Diploma in Environmental Management from the University of Ulster, Coleraine. 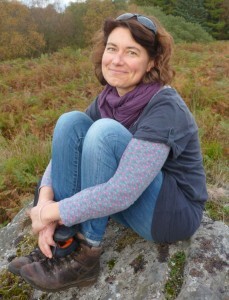 Following her studies, she moved to the UK in 1997 and started to pursue a career in biological surveying and nature conservation. She has developed particular skills in the identification, recording and mapping of higher plants, bats, land mammals, birds and habitats. She also gained substantial experience in practical nature conservation, in particular habitat management and restoration. Over the past five years, Anja has been branching out into the areas of community/ school gardening, horticulture training/ teaching and therapeutic gardening. During 2012, she taught the City & Guilds accredited Practical Horticulture course for the SUSE (Sustainable Steps to Employment) project at the South-West-College campuses in Enniskillen and Dungannon. In her role as the Green Gym project officer for the Western Health Area, she continues to work as a community gardener and walk leader with a wide range of groups. She also gardens with young adults with special educational needs. Anja is Forest School trained and is interested in further exploring the benefits of nature, the great outdoors and especially woodlands for physical, mental and emotional well-being. She firmly believes that there is a great need to re-connect people with the natural world at a deep level.